On Saturday, practically the whole of Alappad panchayat spread across 17 km will begin hunger strikes at different places. Friday marks the 100th day of the anti-sand mining protests in Kerala’s Alappad village and the local mood here can be best described as a fire raging bright. Over 120 people have crammed into the small protest tent in Cheriyazheekal. Loud cries of slogans ring the hot air. Inside the tent, 100 residents from Alappad have begun a 24-hour strike (8 am to 8 am) to get the government to stop mining in their coast. “We will host several people who support our movement from different parts of Kerala today evening. Each of them will bring a handful of sand from their land with them and come to join the protest,” Shajith Chandran, a local protestor tells TNM. For the past three months, the Alappad anti-mining people’s movement, a group of local activists, have intensified their years’ long protest against illegal black sand mining in their village. The 28 km stretch on Kollam’s coastline where Alappad is located is famous for its mineral-rich sand. Mining is being done here since 1965, by Indian Rare Earth - a Central government PSU and the State government’s Kerala State Metals and Minerals Ltd. and this has wiped out nearly 90% of the village. Now, the residents here have just one collective demand - a complete ban on mining. “If they take sand from here anymore, Alappad will vanish from the map,” Sharath Pal, a Muscat based Alappad native, who is on the hunger strike tells TNM. Alappad and its neighbouring panchayats have witnessed massive migration out of the villages in the past few decades. Families and entire communities have moved to other areas as the land they once owned was lost to the sea due to the shrinking coast - a result of extensive mining. The people here do not need an environmental expert to tell them that their village is not vanishing because of natural erosion, as the government claims. Once, 89.5 sq km in size, Alappad has now shrunk to a mere 8 sq km as truckloads of sand are being taken away from here every day and never replaced. “If they deep mine 200 metres of the coast and take away 80% of the sand, the rest of the 20% of ‘waste sand’ is not enough to refill the pit that they have dug up. This is why you see these mining ponds filled with sea water here. There is simply not enough residual sand to fill the pits with,” Shajith adds. Moreover, the sand here is rich in minerals such as Monzonite, Ilmenite, Rutile, Zircon and not all of them are found in its black component. “The black component only contains Ilmenite and Rutile which are used to make Titanium. The other minerals such as Monzonite are yellow and Zircon and Silemenite are white. Garnet, a semiprecious stone, is deep red. So the miners are not just taking away only the black component and leaving the rest, most of the sand here is being used up,” Shajith says. 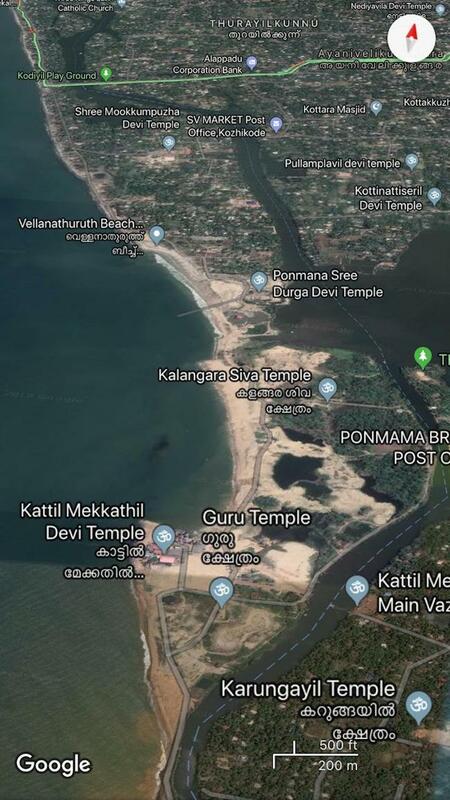 Apart from the exploitation of land, in many areas of Alappad, the sand strip between the TS canal which borders the village and the ocean on the other side, is barely 100 metres. And residents fear that if this is mined away, the canal water will mix with the ocean and submerge the entire area. In January 2019, the plight of Alappad's residents gained state-wide attention. This, after the ‘Save Alappad’ social media campaign which the young residents here launched went viral. When several attempts to blame Alappad’s shrinking coast on Tsunami and natural erosion failed, Industries Minister EP Jayarajan on January 18, finally announced that sea wash mining - an illegal method where sand is taken from the sea shore - will be stopped for a month here. However, residents say that the announcement to stop sea washing has made no difference as the two companies have been secretly mining from the sea shore in the nights. “From 2 am to 4 am, IRE mines in Vellana Thuruthu at the edge of Alappad. As for KMML, they refuse to even bother hiding this and indulge in sea wash mining openly in the neighbouring Panama village. Some of us went there after the minister’s announcement and saw this happening,” Shajith adds. On Thursday, Jayarajan formed an expert panel of district collectors and MLAs to study the issue here, due to mounting public pressure. Addressing a press conference in Thiruvananthapuram, he said that both IRE and KMML are two important companies and there should be a favourable situation for them to function. But the minister’s words fail to douse the unrest felt among the people of Alappad, which if anything, is growing by the day. “If Friday sees 100 protestors, on Saturday, the entire panchayat spread across 17 km will begin hunger strikes in different areas. All families barring the 70 of those who work for IRE and KMML will strike,” Sharath adds.